Top class sprinter Lim’s Cruiser stepped out for a casual spin at the Kranji barrier trials on Thursday, looking all primed ahead of his next assignment in the Group 3 Rocket Man Sprint (1200m) on May 5. Ridden by trainer Stephen Gray’s apprentice jockey Amirul Ismadi (his winning partner at his last local start in a Kranji Stakes A race over 1200m on November 20), Lim’s Cruiser was left alone in centerefield and just took it easy to finish around five lengths off the winner Yulong Xiongyin (Benny Woodworth). With his main objective a third consecutive Group 1 Lion City Cup (1200m) on May 25 (four is the record held by Rocket Man – 2009 to 2012), the Casino Prince six-year-old has basically been kept ticking over since his last start – an unplaced (seventh to Mr Stunning) but meritorious run in the Group 1 Longines Hong Kong Sprint (1200m) at Sha Tin on December 9. With racing opportunities scarce in the 113-point rated sprinter’s own backyard, Gray has had no other choice but to play hopscotch around the racing calendar until he finds a suitable race. 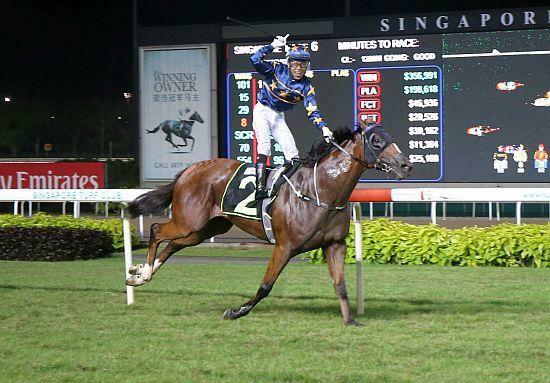 The Singapore Sprint Series would have been the usual angle for the Lim’s Stable ace, but it has been discontinued following the axing of the Group 2 Merlion Trophy (1200m) this year. He still has the other two Legs left, the Rocket Man Sprint which, being a handicap race, will have him under sufferance, and the Lion City Cup, which is a Weight-for-Age race. But beyond those two, Lim’s Cruiser faces a long barren landscape. “We have to keep him happy and keep him cruising as we can’t keep him in his box. That is the only way to go, keep his runs spaced out,” said Gray. “He will have another trial in three weeks’ time and he will then run in the Rocket Man Sprint. He will carry 59kgs, which is a bit tough, but we have no other choice as there are no Weight-for-Age races for him. The Dubai World Cup could have been an option with the Group 1 Al Quoz Sprint (1200m) the obvious pick for the eight-time winner, but Gray’s wife Bridget said they ran out of time. “After he came back from Hong Kong, he had to go in quarantine and that did set us back,” she said. “By the time he was out, it’s too late. It takes a while for these horses to recover after they travel.